There is one good way to find out whether your online presence is achieving its objectives, cutting through and causing disquiet to the established order, and that is to measure the amount of negative behaviour aimed at it. In the case of Zelo Street, that has ranged from personal smears, through anonymous threatening letters, to shouty phone calls and a number of variously creative legal threats. Sadly, all those attempts to silence this blog have been totally unsuccessful, and in the case of the legal threats from the perpetually thirsty Paul Staines and his tame gofer, the odious flannelled fool Henry Cole, have ended up backfiring on the perpetrators and leaving them covered in rather more than confusion, while providing a little light entertainment to my legal team and more excellent spectator sport. 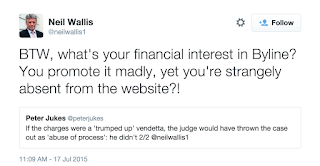 So one might have thought that the smear merchants within the media establishment might think twice before going after an online presence which they perceive as a threat to their cosy cartels, but that thought would have been misplaced, as former Screws deputy editor Neil “Wolfman” Wallis has shown as he has begun to snipe at crowdfunded online platform Byline Media - because it is becoming very successful. 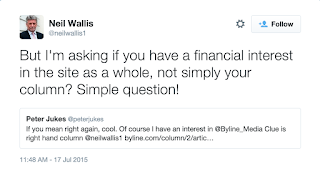 Wallis, who was also known by the rather less felicitous nickname of “The rasping f***wit”, decided to deflect a question by Peter Jukes into the beginning of his smear attempt: “what's your financial interest in Byline? You promote it madly, yet you're strangely absent from the website? !” was swiftly followed by “So do you have any financial interest whatsoever?”, which may seem innocuous, but it is not. During the hacking trial, one of the Mail titles was ready to run a smear on Jukes claiming that his crowdfunding for live-Tweeting proceedings was somehow improper, because he didn’t have a mortgage, but claimed he had missed a payment. 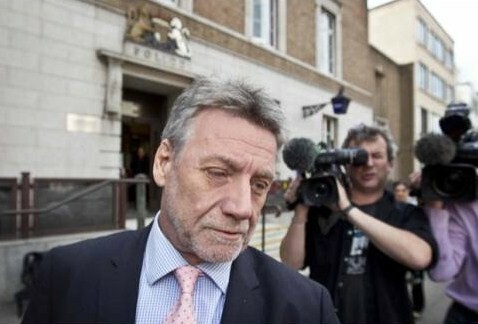 The paper spiked the story after significant online ridicule at the amateurish smear - Peter sold the property concerned during the trial. 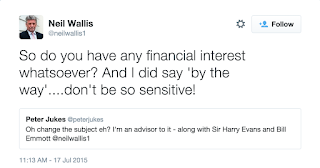 The author of that smear is thought to be a pal of Wallis. 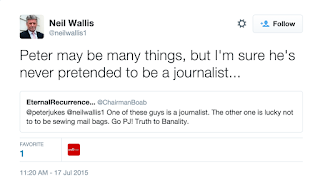 That smearing is the name of the game was clear when Wallis Tweeted “Peter may be many things, but I'm sure he's never pretended to be a journalist”. Classic establishment smear - only real journalists approved by the establishment can have stuff published. This is drivel. 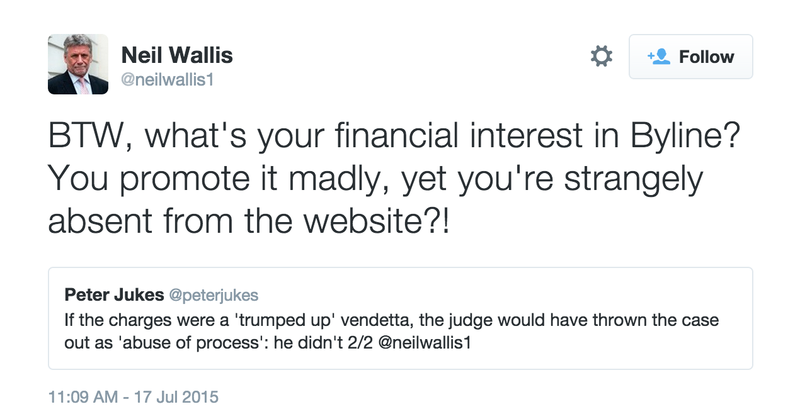 But that wasn’t stopping Wallis: “I'm asking if you have a financial interest in the site as a whole, not simply your column”. Jukes is an advisor to Byline. 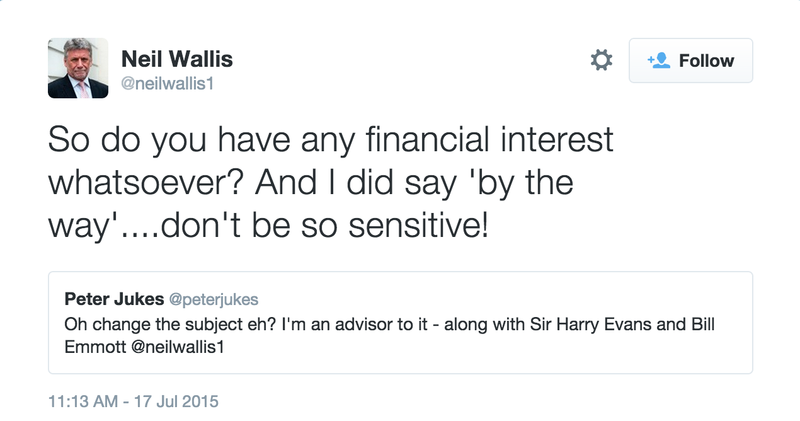 This is well-known, but having this confirmed to Wallis had him suggesting “Wasn't so hard, was it!? 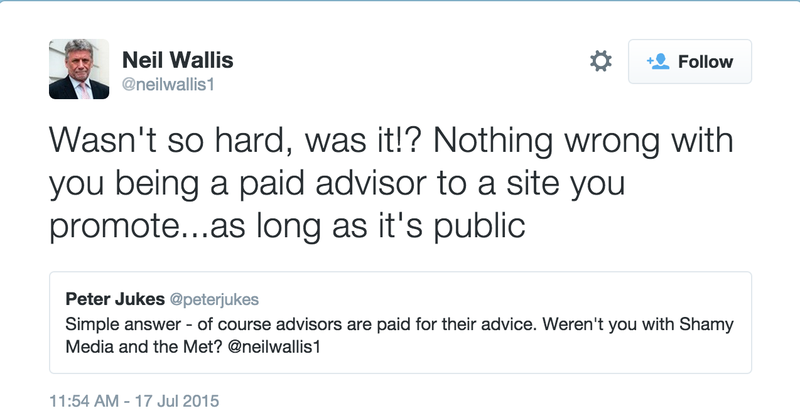 Nothing wrong with you being a paid advisor to a site you promote...as long as it's public”. 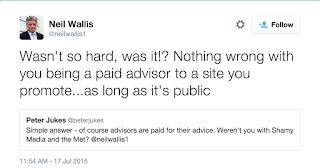 Yes, brave campaigning Wallis drags information out of shady online advisor! Now all he has to do is go back to his pal and get it all inflated into something that can be called a “story”, a “revelation”, even. It looks innocuous at first. But soon it builds into full-on smear attacks. That’s why it’s being called out here. And it will continue to be called out, whoever suggests otherwise. 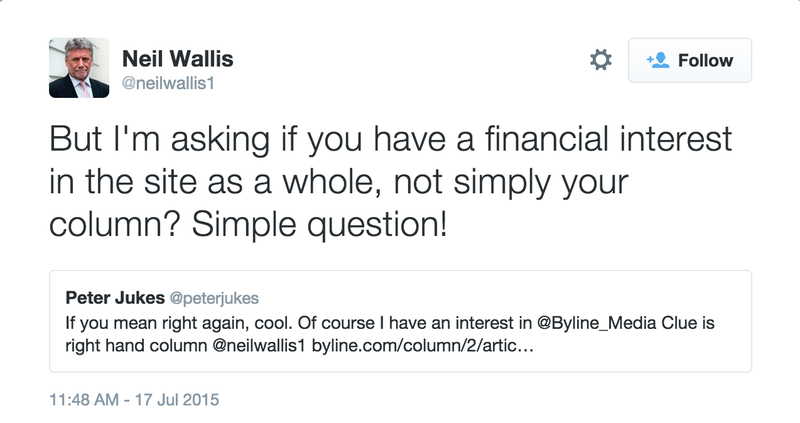 It would be interesting to know what and who contitutes a journalist in Neil Wallis's world. Someone who can be bullied into writing to suit the owner's agenda perhaps? Just as long as it's made public. Rob, I would suggest that a key qualification is to have no idea what those around them are doing. 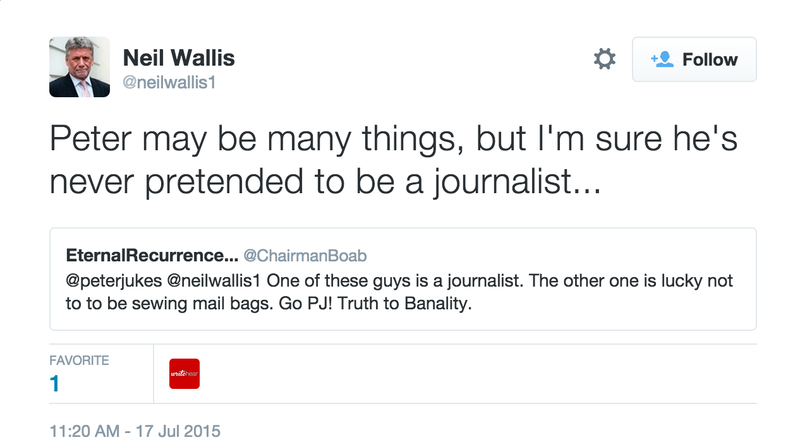 Tim, As "journalists," Wallis and co make good bin men. The really sad thing is that the NUJ presumably welcomes fulsomely the raggle-taggle mob that ply the trade in the gutter. Those of us old enough to recall papers full of the work of the likes of Cameron, Cutforth, Pilger et al, can but look on and despair. Doesn't that apply only to editors, deputy editors, legal team, executives and owners though? Plausible deniabilty rules apply! A bit like Mornington Crescent? Wallis out for a duck? Peter v The wolf(man) . No contest, only one winner! Spinner unspun.